If there is one quilting tool that I use again and again it’s the Quilter’s Slidelock. After my quilting ruler, mat and rotary cutter, it’s the next in line for the most used item in my craft room. After fours years of use, it is still going strong so I thought I would update this page with my Quilter’s Slidelock review. What is the Quilter’s Slidelock? Basically, the Quilter’s Slidelock is a tool that helps you more accurately AND more safely cut fabric for quilting. 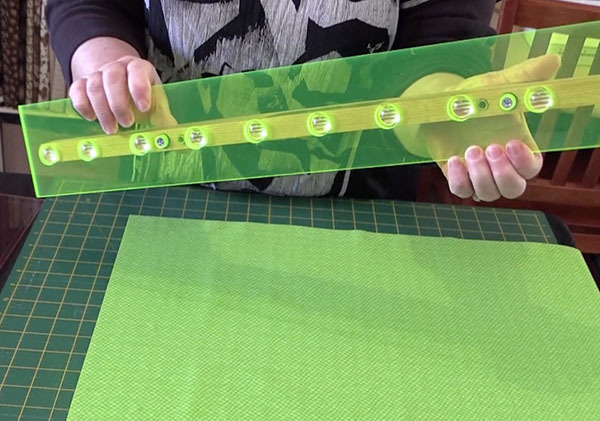 The Quilter’s Slidelock basically works by applying pressure to your fabric so it keeps everything in place without the slipping that you can potentially get with a regular ruler. All you do is put pressure on the handle at the top (and it doesn’t have to be a lot of pressure) and then cut. You can see the suction caps on the bottom of Slidelock in the image below. Where Can You Get the Quilter’s Slidelock? You can purchase the Quilters Slidelock from Amazon. So let’s take a look at what makes this a must have in your craft room. Personally I love it but just saying I love it doesn’t make for a good review so here are some real benefits. When you use your regular quilting ruler you know that it can easily slip if you don’t apply enough pressure. Even then it still has the potential to slip slightly. What this means is that you potentially end up with fabric that is not cut accurately. Even small discrepancies can result in quilt blocks not working out correctly or strips not looking right when sewn. With the Quilter’s Slidelock you don’t get that slippage. The Slidelock is kept solid on the cutting mat so I know that my fabric is going to be straight every time I cut it. It really does help with getting a more accurate cut especially when it comes to cutting strips. 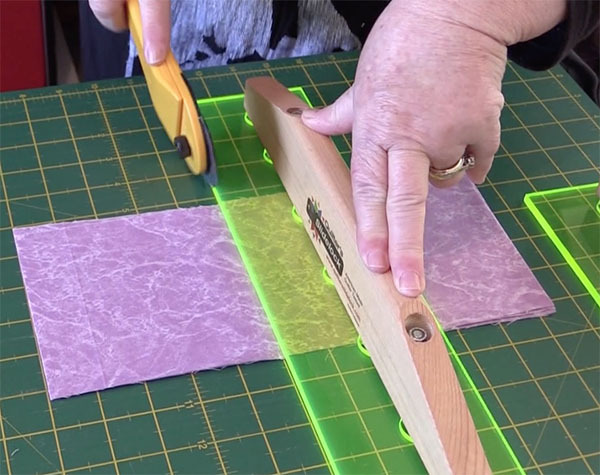 When you use the Quilter’s Slidelock, your fingers are kept well above the ruler’s edge, so it ensures that you won’t be slicing through your fingers which can happen with a regular ruler. Your fingers are kept nice and safe well out of harms way. You know yourself how much pressure you need to place on your quilting ruler to ensure it doesn’t slip. Unless it has non-slip grips applied to it, it’s a lot of pressure. With the Quilter’s Slidelock you don’t need to apply much pressure at all so there is a lot less strain to your body. You can see in the image above that I have only applied two fingers and my thumb to the Slidelock. That is all that is needed. 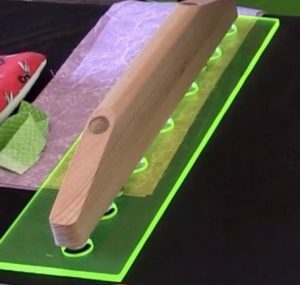 You can watch the video below to see it in action. Some people think this is a ruler and are disappointed when it arrives and their are no measurements on it. It’s only a ruler in the sense that it has a straight edge that you can use to cut. The best way to see it in action is to watch the video below to see how it all works. What Sizes Does the Quilter’s Slidelock Come In? The Slidelock comes in two sizes, 24″ for longer lengths of fabric and 14″ which I find really handy for those fiddly bits of fabric used in quilting. I actually purchased both sizes at the time but I find myself using the longer one more often. So there you go. That is my updated Quilter’s Slidelock review. Mine are still going strong and I couldn’t do without them.